TULSA, Okla. — USF trails Tulsa 10-3 at halftime at H.A. Chapman Stadium in Tulsa, Oklahoma. There’s nothing pretty about this football game. It’s cold, it rained earlier and the football has been bad. Still, USF is competitive in the game despite its struggles. 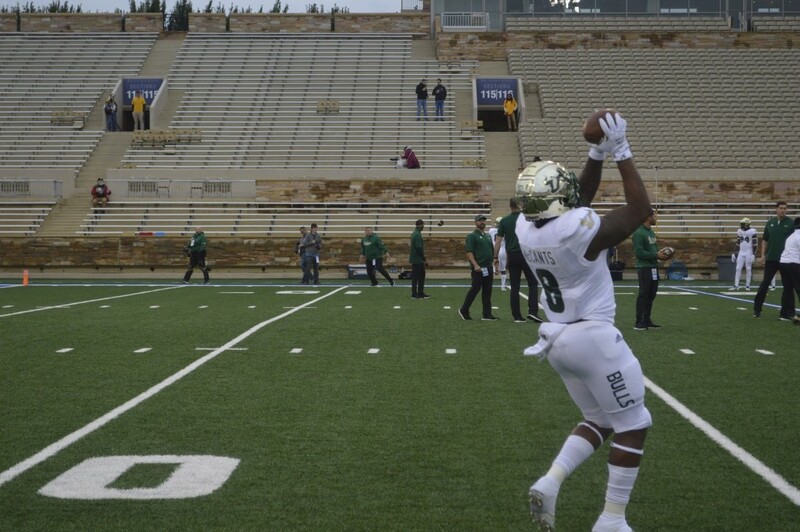 USF’s offense wasn’t as poor as it has been during the first half of previous games, but the Bulls are still leaving a lot to be desired against a Tulsa team that has averaged more than 240 yards allowed during the first half. USF has gained 171 yards through the first two quarters and probably won’t have an easier time in the second half against a Tulsa defense that averages 139 yards against in the second half. Chris Oladokun spelled Blake Barnett for a few plays during the first quarter, rushing for seven yards. There didn’t appear to be anything wrong with Barnett, so it seems the entire sequence was a designed package. If so, it’s a pretty interesting usage of a member of its offense that USF hadn’t been utilizing otherwise. Tulsa is gifting the Bulls yardage. USF is gifting Tulsa right back with missed opportunities. The Golden Hurricane have been flagged eight times for 51 yards, which isn’t terrible, but the penalties have come at pretty terrible times. For example, toward the end of the second quarter, Tulsa had seemingly stalled USF just outside the red zone, but an illegal substitution infraction kept the USF drive going. Conversely, the drive resulted in no points, as the drive ended on a sack of Blake Barnett just four plays later on fourth-and-8. Barnett’s deep passes to his receivers have just not been connecting, for a variety of reasons. Barnett’s longest pass was in the first quarter to Mitchell Wilcox for 45 yards. Tulsa’s defense has appeared to have done its homework, because the Golden Hurricane has had defenders deep every time Barnett attempts to air it out. The Bulls have put up second half comebacks four weeks in a row and only trail by seven points tonight. As nice as it would be to lead at the half, the only score that matters is the one at the end of the fourth quarter and Barnett and company have proven time and time again that they can perform in the most dire of situations. So, sit back, take a breath and let’s see how this plays out.